David received his B.A. in education from National-Louis University in 1992 after enjoying a successful career as a trader on the Chicago Board of Options Exchange for 10 years. He studied theatre and improvisation at the Players Workshop of the Second City and Victory Gardens Theatre. 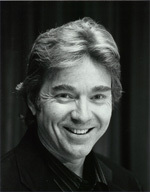 He has taught creative and performing art classes at the Children’s Theatre of Western Springs since 1992. David was a founding member and director of the improvisation group, Laughing Gas, for 10 years as well as his own puppet company, Znkster Puppets. He has also performed and toured in schools with Charmaine & Co. Puppets and The Great American Challenge as well as acted in many adult productions in and around Chicagoland. David also has an extensive background behind the scenes, as a propmaster, lighting designer, and tech director. After 3 years of serving on the staff of a spiritual retreat site in New York, David continued his study of mask making and came to the realization that he always wanted to be an artist. Upon returning to Chicago, David immersed himself in classes and work, honing the necessary skills of the artisan. David creates his art in his Chicago Studio. DK: Mainly, the human face inspires me. I am intrigued by all the different expressions the face can have. The human face is a limitless source of mystery, intrigue, emotion, and drama. The mask-maker freezes a moment of the inner story and reveals the dignity and timelessness of the human condition. The face might be the one thing we see more of than anything else in our lives. We are intrigued by it and constantly look to it for cues. It is compelling, a “window to the soul”, yet sometimes, we are afraid to really look at it deeply. “Don’t stare, be nice.” The mask makes it safe to enter, to learn a little more about our inner story, the inner story of the human beings we are. Children also inspire me. They inspire me to become a better teacher of creative arts. Because they are so young, they wear their creativity right on their sleeves. It hasn’t been squashed out of them yet in the pursuit of reason. I think, as a society, we have become very lazy and cynical as far as our own creativity is concerned. We employ the hired guns from Hollywood, i.e. Disney, Pixar, etc., to entertain us. When I see a child or teen, even an adult, I see all this creativity, waiting to come out, begging for expression. I see stories waiting for a chance to be told. My job is to create some kind of structure for the expression of that creativity. I also get inspired by fine artists who depict the human drama that is written on the face, such as Auguste Rodin, Rembrandt and really talented portrait artists like local Chicago artist, Richard Schmidt. I also appreciate and am inspired by the talent of photographer, Julia Margaret Cameron. MM: What is your medium? Why did you chose that medium? DK: Sculpture, clay and masks. 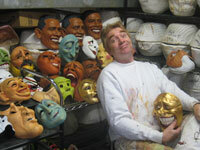 I think that masks and maybe puppetry occupy a place where fine art and performing arts meet. With my feet entrenched in both camps, it is natural that I would gravitate towards mask making. I spent many years working in theater: acting, directing, teaching and working in various puppet companies, at one point, I came across master teacher Isabelle Anderson. Through time spent studying with Isabelle, I recognized the power and depth that mask work can access. MM: What is the purpose of art? DK: To gain a deeper appreciation of nature, of God, of spirit, to slow things down and freeze a moment of time. The mask does that also. It captures a moment of the inner story from the human face. A good mask can be displayed and appreciated as a work of art. Or the mask can be worn. Mask work helps us access and claim some of these archetypal energies that we keep hidden from ourselves and others. In a mask, we can explore both the positive and negative aspects of the human psyche. To me as people try on another aspect of their selves, there is an energy release, an enrichment that happens. They seem to feel empowered, more whole, more life. MM: Who has been the main influence in your work? DK: It would have to be Isabelle Anderson, watching and experiencing her expertise with mask work. There was a moment, when it was absolutely clear to me that masks are power-filled objects that have life in them when in the hands of a masterful teacher. In shamanic tradition, they believed that masks are power-filled objects with the ability to communicate with the spirit world. To see that process come to life, in the hands of a guide who is able to facilitated genuine and meaningful self-discovery is truly inspiring. Another influence is Susan Clinard, a Chicago artist and teacher (http://www.clinard.org/). Susan sculpts with a genuine love for humanity. Her incredible talent and her joy for the process inspire me. When I went back to study, I felt blessed to find Susan. Her classes are very lively and laughter filled, making sculpting even more fun. MM: What is your process? What are your tools and methods? Click here to see the ABC7 interview by Harry Porterfield.